The fifth-generation Honda CR-V has been launched in India. We tell you all about the important updates and features on the 2018 Honda CR-V. The all-new Honda CR-V has been launched at ₹ 28.15 Lakh (Ex-Showroom, India). The 2018 Honda CR-V is the fifth-generation model and gets a bunch of updates over the previous generation model. 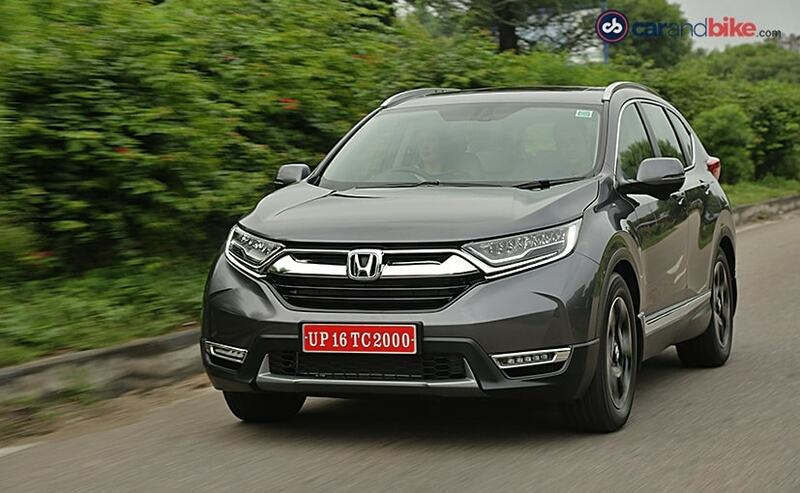 The new Honda CR-V now is also offered in a diesel variant and the diesel Honda CR-V gets optional 7-seater configuration which add some more practicality to the overall package. We explain some of the key features of the 2018 Honda CR-V. The 2018 Honda CR-V has a butch front end face that sports a large grille with bold chrome slat, sleek and angular headlamp cluster with LED DRLs and a sizable cladding running the width under its nose. 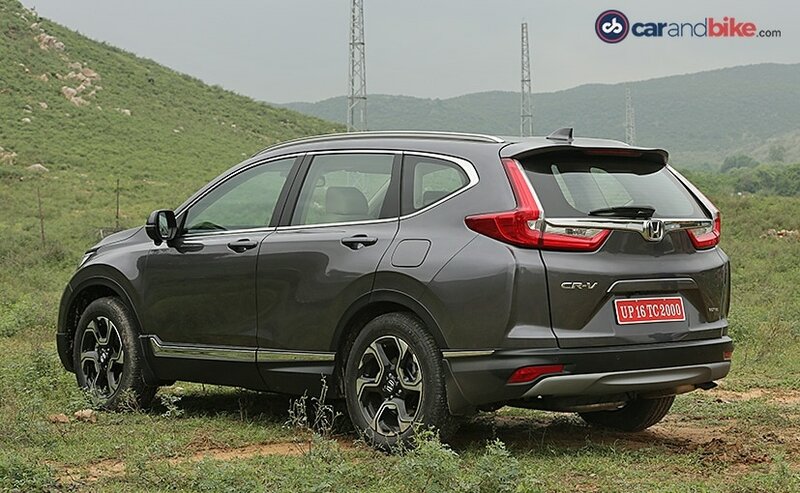 The new CR-V retains rounded corners at the front and similar to the previous model has bulging wheel arches and high positioned chrome window line with the quarter glass cutting into the D-Pillars. The rear of the new CR-V is now edgy at corners and it gets beautiful L-Shaped tail-lamps, decent chrome treatment beneath the rear windscreen, low-positioned license plate housing and grey cladding at the departure angle. It is 47 mm longer and has a 40 mm larger wheelbase than the outgoing model. It has ground clearance of 208 mm enabling it to tackle tough terrain better. Overall, the styling of the CR-V gives it robust road presence. The highlight of the new Honda CR-V is the new seven seat configuration in the diesel, but the petrol CR-V still carries a 5-seater layout. The additional 40 mm wheelbase does reflect inside the cabin but only with the middle-row seats pushed all the way back making it difficult for an adult to sit in the third-row. The seats come with recline function and are adjustable to be set at a position making required space for all the occupants. However, that's not all as the cabin we are talking about is entirely new. The interior layout in the CR-V is all-new too. 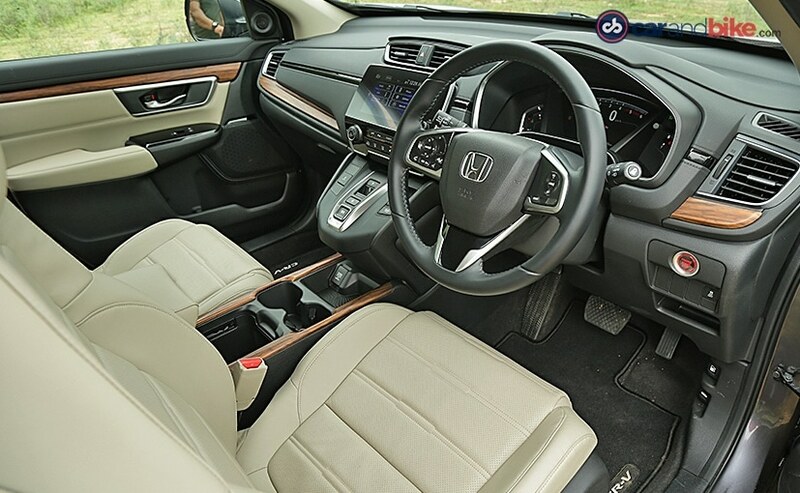 The cabin is finished in dual-tone black and beige with soft-touch upholstery and Honda has tastefully used wood and chrome inserts on the dashboard, door-pads and central console. The diesel CR-V gets push switches as a gear selector which might take a little while getting used to. The new Honda CR-V will also wear the i-DTEC badge, essentially diesel. The motor is a 1.6-litre, four-cylinder, turbocharged diesel unit that puts out 118 bhp at 4,000 rpm and 300 Nm at 2,000 rpm. It is mated to a 9-speed automatic gearbox with paddle shifters. The diesel CR-V is available in both two-wheel-drive and four-wheel-drive guise. Honda has claimed an impressive fuel economy of 19 kmpl on the two-wheel-drive CR-V while the four-wheel-drive version delivers 18.3 kmpl. 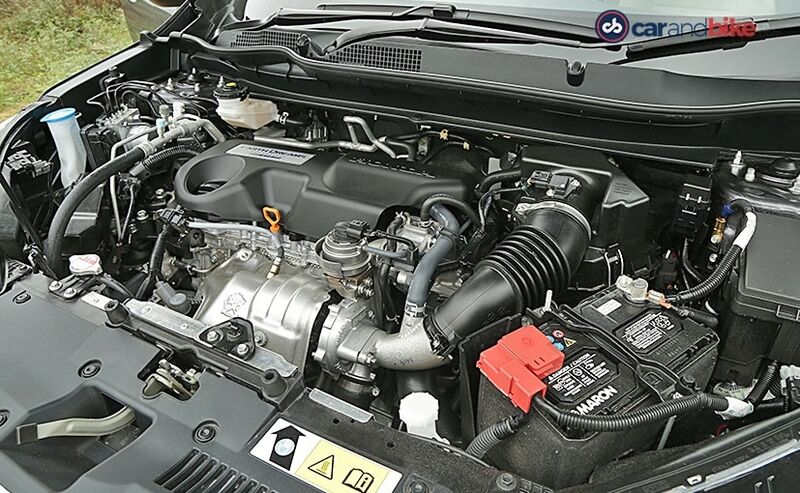 This engine has been designed and assembled at Honda's Greater Noida plant in India. Honda says that it's been designed to be lighter and less frictional in order to increase efficiency and reduce NVH levels. The Petrol variant is still very CR-V in mechanism being driven by the same powertrain and gearbox combination. Under the hood is the 2.0-litre, four-cylinder, i-VTEC (Honda's nomenclature for petrol) motor that churns out 152 bhp at 6,500 rpm and 189 Nm at 4,300 rpm and is paired to a CVT transmission. The cabin of the 2018 Honda CR-V is loaded with all the segment standard features. Some of the highlights are a 7-inch touchscreen unit with connectivity features like Apple Car Play, Android Auto and Bluetooth, however the SUV misses out on on-board navigation. Moreover, it packs a lot of information, more than required on a daily basis. 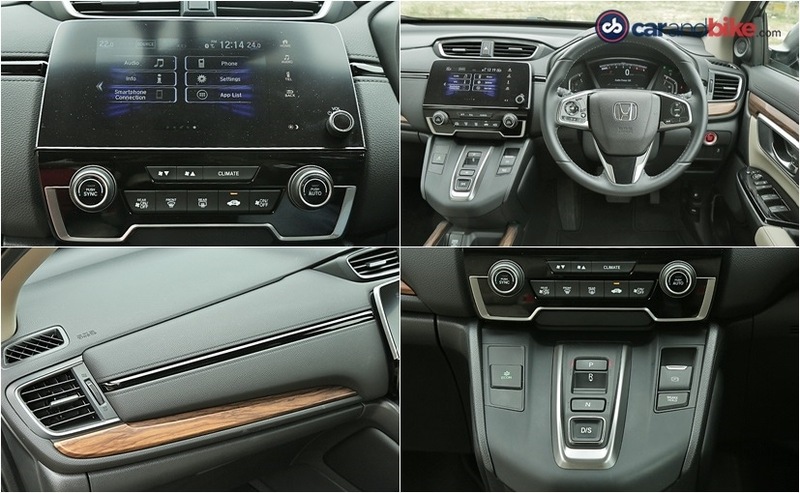 Other features available on the new Honda CR-V are power adjustable seats and wing mirrors, height and reach adjustable steering wheel, auto-diminishing inner rear view mirror, auto-climate control and 10 dedicated roof-mounted air-con vents. Standard safety features include six-airbags, ABS, ISOFIX child seat mounts, vehicle stability assist, hill start assist, seatbelt pre-tensioners and a driver attention monitor. Furthermore, the 2018 Honda CR-V has scored a full five-star rating in the ASEAN NCAP crash tests.